Most Minnesotans would agree that spring has finally sprung (albeit about one month later than we would have liked). A windy, cool, and somewhat wet beginning of the week transitioned into warmer days in the 60’s with lots of sun, allowing us to enjoy the great outdoors in t-shirts once more. This weekend looks nothing short of amazing, with high temperatures approaching 70 degrees Fahrenheit and plenty of sun (with a small chance of rain on Sunday). Next week looks to be similarly warm (surpassing the 70-degree mark around mid-week) but with more chances of showers on a few days. Last Friday evening a weather front moved through southern MN, and on the backside of it were many migrant songbirds. Birders throughout the southern half of the state on Saturday morning found a fallout of bird activity, with hundreds of migrating sparrows, many warblers, and other new arrivals being common sights. Here in the Arb, Saturday morning brought many FOYs (first-of-year), including White-crowned and Clay-colored Sparrows, Brown Thrashers, Chimney Swifts, Red-headed Woodpecker, and Rose-breasted Grsobeak. Since then, new arrivals have been showing up almost daily in the Arb; this morning’s FOY highlights were singing Grasshopper Sparrows in the Coneflower Prairie and 3 Soras in the Jim Gilbert Teaching Pond. 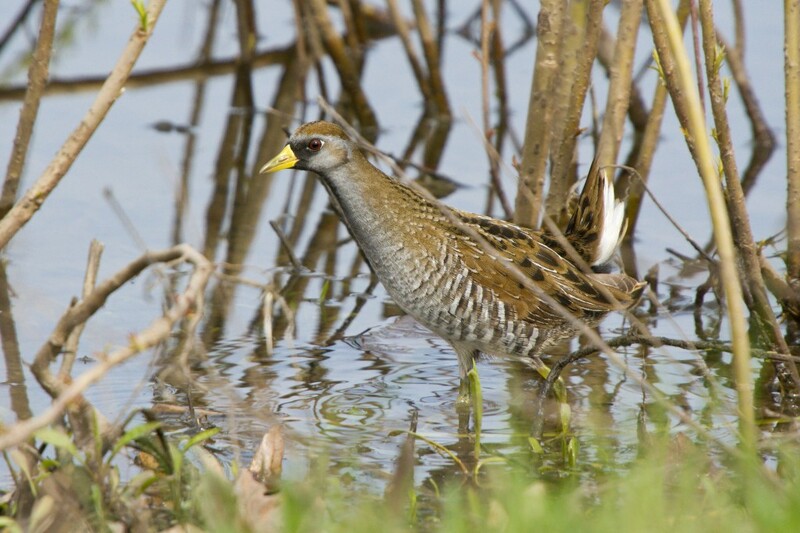 One of three Soras in the Jim Gilbert Teaching Pond, 5/6/11.